Long before the gunfire in Charleston harbor announced the opening act of the Civil War, the conflict's bloody violence was adumbrated by years of robbery, arson, torture, murder, and revenge waged on the tall grass prairies along the Kansas-Missouri border. 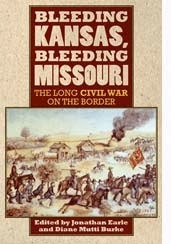 The 15 uniformly excellent essays contained in Bleeding Kansas, Bleeding Missouri help explain what united and divided the men and women who inhabited these contested borderlands, why their social and political differences helped ignite a civil war that engulfed an entire nation, and the difficulties they experienced trying to rebuild their homes and reconstruct their lives after hostilities ended. The editors have chosen not to focus on the military engagements that took place in the region between 1861-1865, wisely leaving those stories to other scholars. Rather, these essays, originally presented as papers at two conferences offering new regional research, examine how the conflict over slavery transformed the border region and eventually the nation, how the residents were affected by the "hard war" practices that evolved there, and why the myths and memories that influenced the rebuilding of the border states live on even to the present day. In the process, readers are offered nuanced definitions of liberty, manliness, loyalty, democracy, citizenship, and freedom that emerged from the borderlands' blood-drenched soil. The late Michael Fellman, pioneering scholar of the region's vicious irregular warfare, sets the stage for the essays that follow. Immersed for years in the letters, journals, and memoirs of soldiers and civilians who lived and fought in Kansas and Missouri, Fellman takes a particularly harsh view of events transpiring there. For him, the border conflict is a continuation of an age-old practice running throughout Chrisindom from the medieval Crusades through the religious wars of 17th century Europe and the Indian Wars of colonial America; a holy "war of all against all," the English philosopher Thomas Hobbes called it. Along the border, Fellman found, people who were once neighbors, spoke the same language, and shared cultural values "victimized one another, lied, dehumanized their enemies, lost all empathy and retreated into numbness, and buried their consciences behind a high, hard wall of utter antipathy." For those who see the irregular warfare along the border as an aberration, Fellman concludes "such assumptions may reassure us, but they are grounded in a refusal to look into the abyss that is actual war." Kristen K. Epps begins the story during the original settling of the verdant prairie grasslands. Since many of the first pioneers came from the South, they brought their slaves with them. "Even from an early date," Epps observes, "slavery was a visible part of life on what would become the Kansas-Missouri border." Slavery was an integral part of the earliest stirrings of the "Manifest Destiny" spirit that spurred white westward expansion. "Progress was the leitmotif that bound white Americans, of all stripes, to the West," Epps concludes, "and for white Southerners, slavery's spread was part and parcel of that progressive spirit." Nicole Etcheson's reviews the proslavery party in antebellum Kansas and their claim to be the party of law and order. Kristen T. Oertel brings a new dimension to border war studies, arguing that an evolving sense of what constituted black and white manliness brought issues of race and gender into the era's sectional debates. Other essays analyze the debates over the legitimacy of the proslavery Lecompton Constitution of 1856 in Kansas and in Washington, how the Federal government and the state of Missouri responded to the violent cross border anti-slavery activities of Unionist Jayhawker bands in late 1860, and, according to Jonathan Earle, how Kansas played a pivotal role in the political life of Abraham Lincoln. "Without Kansas," Earle claims, "Abraham Lincoln would never have been president of the United States" even though he visited there only once, for a week, in the fall of 1859. Once the war began in earnest, determining the loyalties of a divided citizenry in Missouri, a slave state within the Union, became a complicated and increasingly violent process. Christopher Phillips details how occupation by Federal forces, the suspension of civil authority, a provost marshal system, and trade and travel policies "restricted civil liberties at the local level as part of a broader strategy to establish control of a[n]…often armed population whose true loyalties were frequently uncertain and ephemeral." Many in that armed population, men like Bloody Bill Anderson, fought as guerrillas. Joseph M. Beilein, Jr. establishes insightful connections between guerrilla fighters, the women who supported and often clothed them in distinctive garb, and how "this cooperative effort between women and men became the logistical backbone for guerrilla warfare." No analysis of the border war would be complete without understanding how it was reconstructed and remembered in the post-war years. Aaron Astor shows how white supremacy lived on in Western Missouri in the pages of The Lexington Weekly Caucasian. According to Astor, the newspaper "quickly established itself as one of the leading papers west of St. Louis and acquired a national reputation for vituperation, sarcasm, and militancy." In the face of such strident opposition, newly emancipated and enfranchised African Americans sought to assert their new rights by organizing politically. But, according to John W. McKerley, "although Missouri's new constitution was arguably the most progressive in the former slave states in the period before the Reconstruction Acts, it failed to address many of the needs of black people." Factionalism between black and white Republicans quickly allowed Democrats to regain power in state government "leaving black men and women to continue their struggle to find a measure of power and protection in a new white supremacist order." Finally, even though the Kansas City Star opined that the September 1898 Blue Springs picnic "differed in nothing from the dozen other country picnics which have been held this year," Jeremy Neely's fascinating essay reveals that this gathering was anything but ordinary. Organized by Frank James (older brother of Jesse), it brought together former Civil War comrades who had ridden with William Clark Quantrill. These get togethers, held until 1929, allowed aged bushwhackers "to share jokes and war stories" that, in the minds of many Lost Cause believers, justified their ruthless activities along the Kansas-Missouri border, including the notorious sack of Lawrence, KS on Aug. 23, 1863. For Neely, these reunions "illuminated the complex ways that memories of the border war served at once to unify and divide people along the Missouri-Kansas line well into the twentieth century." Neely finds that old stock Southern sympathizers defended "Quantrill and his men by emphasizing their courage and honor -- these were men who never harmed women, it was often said -- and by explaining their actions as justifiable responses to plundering Kansans and Unionists." It is small wonder that the bitter embers of the Civil War on the Kansas-Missouri smoldered for years after official hostilities had ended.